A resident of Aba, the commercial hub of Abia State, Miss Esther Nmecha, has solicited financial assistance from good-hearted Nigerians to enable her to settle her hospital bills. 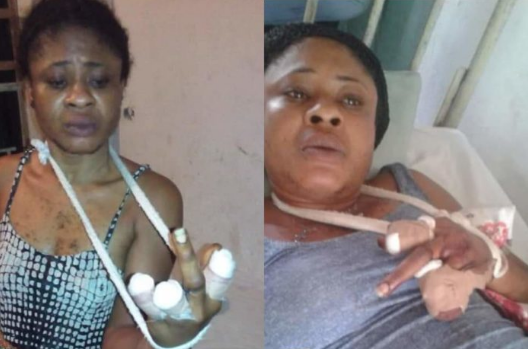 Nmecha is currently battling for survival from the injuries she sustained from a brutal attack by some of the notorious armed herdsmen terrorizing Nigerians. She was attacked on Sunday, March 31. 4pm on the day when herdsmen encroached on her business premises at Peoples Road, Ogbor Hill, Aba. Nmecha stated, “In making real their threat, one of the Fulani herdsmen brought out his machete and targeted to cut my neck. It was in an attempt to defend myself that he missed his target and cut off my four fingers. “I was rushed to the Police Clinic at the Central Police Station, Aba, where they immediately referred me to the Aba General Hospital as a result of the critical nature of my case. But due to paucity of funds, my treatment has been stopped, because I am unable to raise the N60,000 deposit demanded by the hospital.